The day started out early meeting Cindi and Jen-knee at Trolley Square to snag some tickets for the 2010 Sundance Film Festival. We had an eleven o'clock time and planned to get there early per our Sundance ticket coaches, Jen and Jon. We arrived and immediately Jen-knee and Cindi planned out our movie experience with preferred times and dates of movies showing later on this month. Jen and Jon arrived (with donuts - it was AWESOME!) and Jon instructed the sugared up Jen-knee on checking the posted available movies. Jen-knee would check the times and Cindi would update the list. After waiting for 10:30 (the time to get in line), I jumped in line with Cindi. We got through the line and finally made it up to a cashier to purchase tickets. I stood behind Cindi as she read off the list of movies and their codes. I soon became fascinated with the two women and their supposed "coach" to the whole Sundance ticket experience. The two women were holding the Sundance movie guide reading the schedule and then sifting to see if they wanted to see the movie. Clearly they were amateurs with a terrible coach on the whole process (Jon is superior). Needless to say... 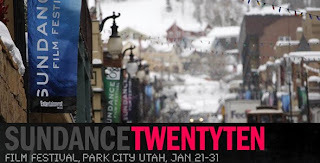 I am attending 5 flicks at this year's Sundance Film Fest and I'm excited.